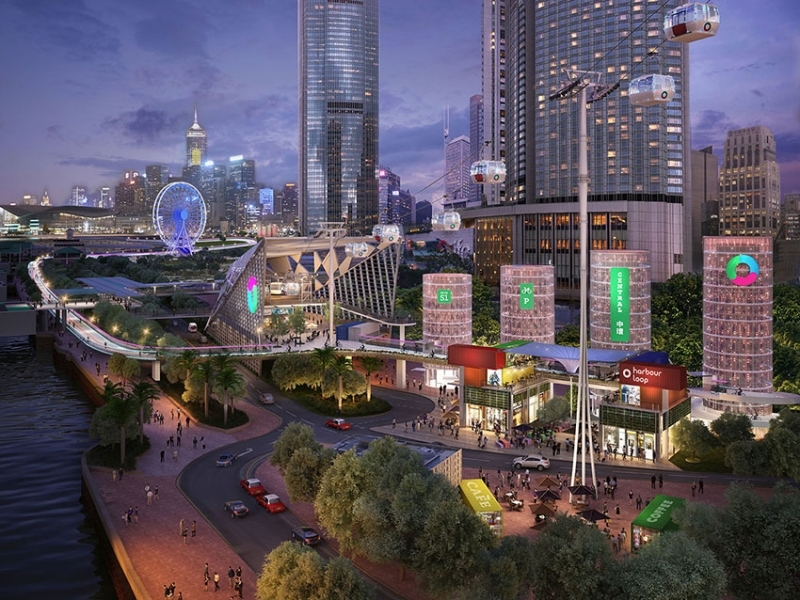 Conceptual Rendering of the Hong Kong “HarbourLoop” Proposal by Lead 8. Image Courtesy of Lead 8 Hong Kong Limited. From Norway’s cross-country bicycle highway to Copenhagen’s cycling snake, large-scale cycling infrastructure projects around the world are attracting both public and private investments. With Amsterdam appointing its first Bike Mayor and London having cycling as a prominent issue during its mayoral election, pro-cycling campaigns are seizing the moment to normalize cycling as a way of daily transit. Primarily known for its efficient public transportation system, Hong Kong has not actively explored the potential of cycling on a municipal level. Yet could Hong Kong benefit from getting more people on their bicycles? Would the right infrastructure and pro-cycling campaign create a passion for ground-level, zero-emission transportation? The city does have a few legitimate excuses for not embracing cycling wholeheartedly: hilly terrain, humid tropical weather, and crowded streets. Yet, with the right infrastructure and political will Hong Kong does have the potential to become a cycling-friendly city. 95% of Hong Kong’s population live on 20% of Hong Kong’s land, the rest 80% remains undeveloped due to its extremely hilly topography. However, a booming city has developed on the flat terrain. According to a study by Lead-8, a multidisciplinary design studio, 1.7 million residents live within a ten minute walk of the harbour front. Since its population is densely concentrated on flat terrain, a small amount of investment in infrastructure that connects active areas could move a large amount of population around the city. Apart from its hilly terrain, Hong Kong has hot, humid, and long summers. Almost 90% humidity in the summer months makes any outdoor activities less desirable. However, shaded and comfortable urban biking infrastructure could help cyclists enjoy their rides even in the hot summer. Moreover, many workplaces are encouraged to have showers and changing rooms to accommodate cyclists. The newly updated LEED Green Building Guidelines, in addition to bike storage, credits buildings that locate near a cycling network and provide shower facilities for occupants. Weather is never perfect for cycling, but practical solutions are available to make cycling easy and comfortable in Hong Kong’s climate. How about Safety? The already crowded streets put cycling safety in question. Mostly designed for narrow single or double-lane traffic, the streets are barely wide enough for cars to circulate. However, crowded streets are exactly the reason why Hong Kong should do more to promote cycling. Moving cars around is less space-efficient than moving bikes around. If less street space is dedicated to car traffic, more people could benefit from using safer, and better-connected cycling or pedestrian streets. Tokyo too has crowded streets shared by pedestrians / cars / and bicycles, but it does not stop 85% of its population from owning and riding bikes. A well-connected network in a road-sharing environment will largely off-set the obstacles. In Hong Kong, only 6.6% of the population travels daily from home to work in private vehicles, and nearly 2/3rds of the population travel by mass transit. Hong Kong is already an efficeint city with regards to transportation, so what added value can cycling and bring? The goal of promoting cycling is not to compete with available mass transit. The real benefit is to provide more options for sustainable and efficient modes of transit. When options are available, people will always choose the best way to get around – the fastest and cheapest way. As many excuses as the city for not embracing cycling, the discussion of promoting biking should not be hindered, since it is never easy for any city to adopt an efficient and well-used cycling network. A Hong Kong-based multidisciplinary architecture and design studio, Lead-8, proposed a 23-km urban pathway network – HarbourLoop. This visionary plan presents a biking/walking/running mobility network that connects currently segmented harbourfront footpaths. While this proposal is grand and ambitious, Hong Kong will have to start somewhere feasible if it is serious about introducing bike-friendly infrastructure. But there are plenty of potential starting points. Hong Kong is not as far from being a cycling-friendly city as we think. Dennis Hodgson - I don’t live in the city, and most casual visitors to Hong Kong are unaware that there is more to Hong Kong than just the city. The new towns in the New Territories have extensive networks of dedicated cycle tracks, and the government is committed to building more. And from a recreational point of view, there are also many quiet roads where it is possible to cycle in peace. I can’t ever see cycling being a viable/sensible option in the city.